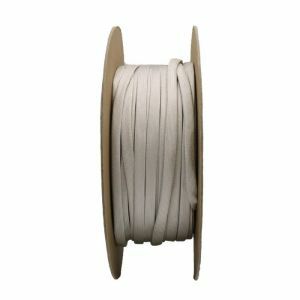 Select Size 24 AWG 22 AWG 20 AWG 18 AWG 17 AWG 16 AWG 15 AWG 14 AWG 13 AWG 12 AWG 11 AWG 10 AWG 9 AWG 2 AWG 0 AWG 3/8" 7/16" 1/2" 5/8" 3/4" 7/8" 1"
Tightly braided fiberglass sleeve completely coated with Polyvinyl Chloride resin to provide superior electrical and thermal protection. Dielectric Grade A: 8000V minimum average breakdown, 6000V minimum individual. 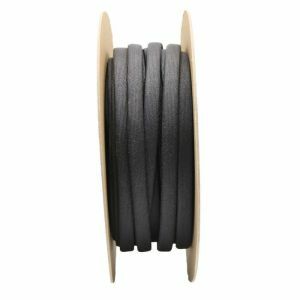 24 AWG 500 FT/SPOOL BSVB-024G 0.022"
22 AWG 500 FT/SPOOL BSVB-022G 0.027"
20 AWG 500 FT/SPOOL BSVB-020G 0.034"
18 AWG 500 FT/SPOOL BSVB-018G 0.042"
17 AWG 500 FT/SPOOL BSVB-017G 0.047"
16 AWG 500 FT/SPOOL BSVB-016G 0.053"
15 AWG 500 FT/SPOOL BSVB-015G 0.059"
14 AWG 500 FT/SPOOL BSVB-014G 0.066"
13 AWG 250 FT/SPOOL BSVB-013G 0.076"
12 AWG 250 FT/SPOOL BSVB-012G 0.085"
11 AWG 250 FT/SPOOL BSVB-011G 0.095"
10 AWG 250 FT/SPOOL BSVB-010G 0.106"
9 AWG 250 FT/SPOOL BSVB-009G 0.118"
2 AWG 250 FT/SPOOL BSVB-002G 0.263"
0 AWG 100 FT/SPOOL BSVB-000G 0.33"
3/8" 100 FT/SPOOL BSVB-0375 0.387"
7/16" 100 FT/SPOOL BSVB-04375 0.45"
1/2" 100 FT/SPOOL BSVB-050 0.512"
5/8" 100 FT/SPOOL BSVB-0625 0.64"
3/4" 100 FT/SPOOL BSVB-075 0.786"
7/8" 100 FT/SPOOL BSVB-0875 0.893"
1" 100 FT/SPOOL BSVB-100 1.018"
High temperature vinyl coated coated fiberglass braided sleeves are commonly used in high voltage applications where flame resistance is necessary. Such applications include radio, television, and electonics, as terminal insulation. 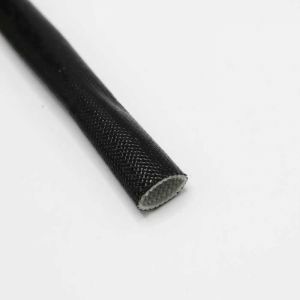 These instances have operating temperatures below 130°C. Also because of its flame retardancy, vinyl coated glass is ideal for applications involving soldered splices and terminations. 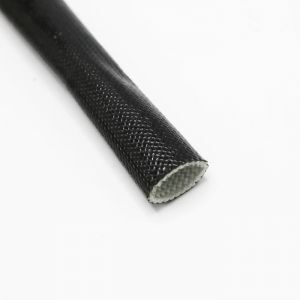 Our tightly braided fiberglass sleeve completely coated with Polyvinyl Chloride resin provides superior electrical and thermal protection and it's equivalent to Ben-Har Vinyl, Varflo sleeving, Hilec 310B series (317F is Grade A), Alpha Wire PIF-130. Excellent chemical resistance to: Acids, weak alkalis, esters, fungus and corona treatment. Available in NEMA sizes #24 (AWG) to 1". NEMA TF-1, Type 3.